Josh Thomas (an Urban Dream Brokerage Advisory Board member) heads the water diviners at the opening of Awa HQ. Image: Justin Spiers. Water divining in the Dunedin town belt has kicked off the first of two innovative public art commissions, which sees artists respond to the city’s environmental needs as part of Te Ao Tūroa, Dunedin’s Environment Strategy. In a programme called Environment Envoy, Dunedin’s Urban Dream Brokerage announce two projects following a call for proposals in August: Awa HQ, a collaboration by Angela Lyon, Aroha Novak and Charlotte Parallel dedicated to Dunedin’s Toitū stream, and What Grows Where You Live, a project led by artist Ruth Evans involving revegetation and artwork creation with native plant species. The commissions, worth $6500 each, are part of Dunedin's Urban Dream Brokerage service, funded by Dunedin City Council and supported by national public art organisation Letting Space. Awa HQ acknowledges Toitū stream, hidden within Dunedin’s CBD, provides a vital connection to Dunedin’s environment and heritage. The project looks at the history, condition and relationships of the stream by gathering together diverse stories, experiences and responses. Treating the stream as a living entity, the artists were inspired by the passing of the Whanganui River Claims Settlement Bill, which in March which gave the Whanganui River, Te Awa Tupua, the same status as a legal person. The project was launched with a picnic and a water divining hikoi with Stephen Kilroy and Taonga Pūoro artists Jennifer Cattermole and Jessica Latton on 25 November. They are now inviting other artists to respond to their call this coming weekend Saturday 9 December 12pm to 4pm by presenting work at Awa HQ, an empty lot at 175 Rattray Street, Dunedin, beside the now concealed stream. Featuring a range of performances, actions, discussions and picnics Awa HQ will culminate in a final hikoi on Saturday 17 February 2018. The second project What Grows Where You Live embraces the biodiversity available in Ōtepoti/Dunedin. Focusing on the plant species raupo, harakeke, kowhai and poroporo, the project begins by working with private and public landowners to introduce native flora across the greater Dunedin region through planting schemes. Materials will be gathered from these sites to be used in constructing art works hosted in a vacant space in Dunedin’s CBD in April 2018. 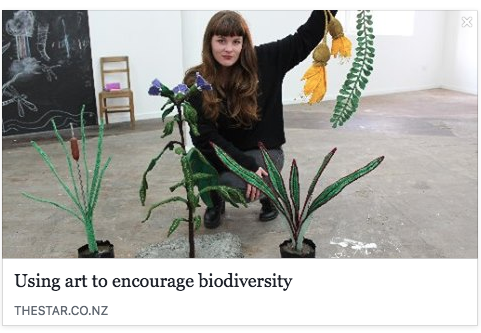 The exhibition will feature workshops for skills and knowledge sharing, and a zine providing understanding of where these plants grow, how to source them, and their traditional application in Māori society.